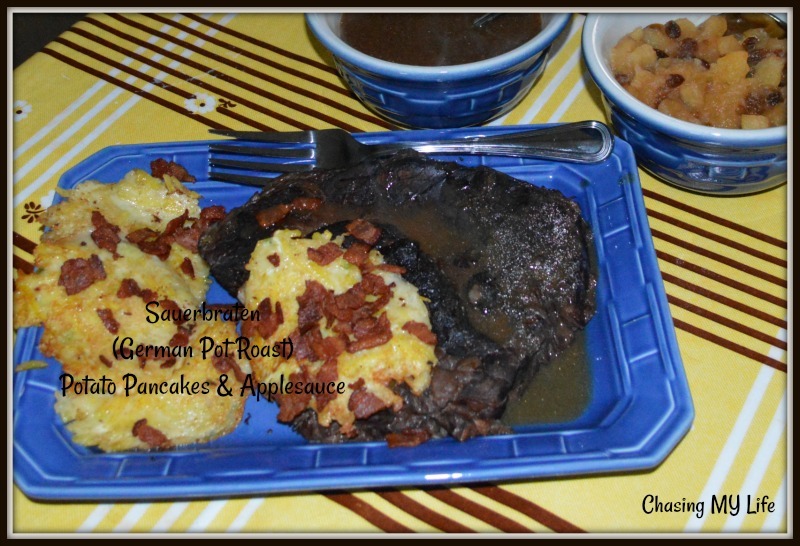 Years and years ago when people still went to brick and mortar book stores, I found this great old cookbook that had many great German recipes. 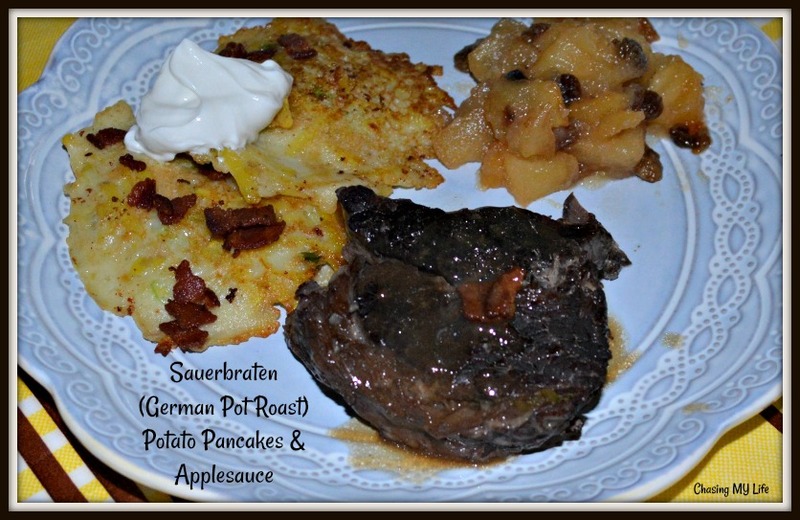 All these years later I have donated the cookbook, but still have the recipes I fell in love with, Sauerbraten and Potato pancakes with homemade applesauce and sour cream. As time went on I made a few changes to enhance the recipes to our tastes, but all in all they are the same tried and true recipes. THIS IS A RECIPE THAT TAKES 5 DAYS TO MAKE so plan ahead. Season beef liberally with salt. 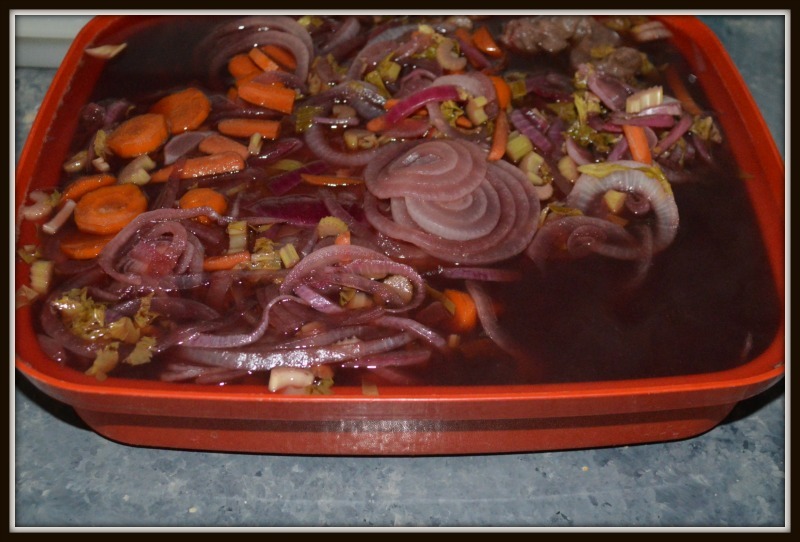 Bring wine, vinegar, shallots, onions, celery, carrots, bouquet garni, beef broth and water to a boil in a large saucepan. Cool slightly and pour over beef. 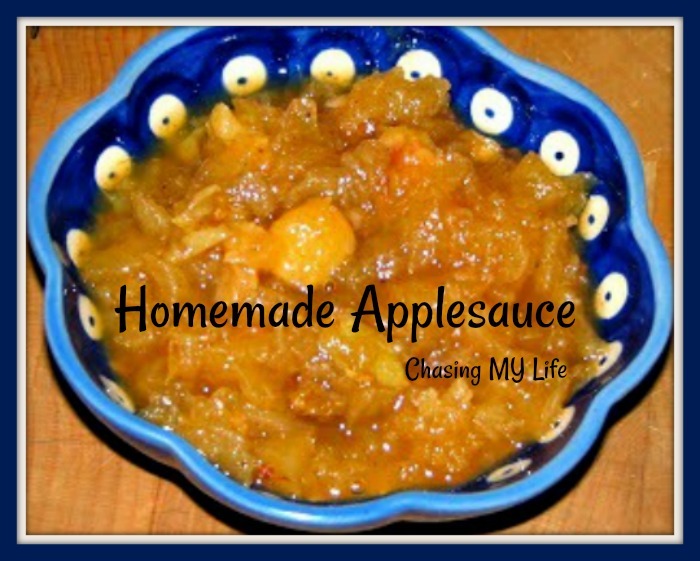 Cover and refrigerate, turning** once or twice a day, for 5 days. NOTE: **A large tupperware marinader is a god send for this. You never have to touch the meat or make a mess turning it. SERIOUS NOTE:** After pouring the brine over the meat, allow it to cool for 30 minutes! ESPECIALLY if using Tupperware products. If you don’t the seal will more than likely leak and you might make a mess the first time you flip it (like I did the first time I made this). 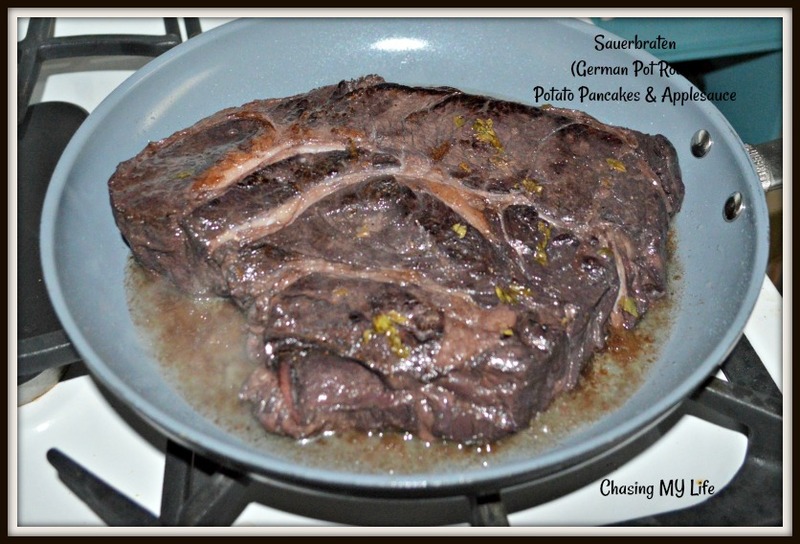 Remove beef from marinade; pour marinade through a fine strainer into a bowl, and dry beef thoroughly. (Reserve 5 cups of the marinade and the bouquet garni.) You can also at this time based on your tastes replace a portion of the marinade with beef broth. If I have used a BOLD red wine, I will often do this to soften the flavor and enhance the sourness of the vinegar. Heat 2 tablespoons butter in an 8-qt. Dutch oven over medium-high heat. Add bacon and cook until bacon renders its fat, about 10 minutes. Transfer bacon to a paper towel lined plate; set aside. Add beef; cook, turning, until browned all over, about 25 minutes. *** Transfer to a plate; set aside. Add remaining onions to pot; cook, stirring, until caramelized, about 18 minutes. Return beef to pot with reserved marinade and sachet; boil. Cover; bake until beef is very tender, about 2 1⁄2 hours. Pour sauce through a fine strainer into a bowl. Return pot to medium-high heat; add remaining butter. Add flour and sugar, whisking constantly, until lightly browned, about 5 minutes. Add sauce, raisins, gingersnaps and lemon juice, bringing to a simmer, cover pot, and cook until slightly reduced, about 10 minutes. (***If you refrigerated your meat for slicing later in the earlier step, you can add the slices in at this point for reheating). Slice beef; arrange on a platter. Spoon sauce over top; sprinkle with bacon and parsley. NOTE:* I like to use the hearts. FYI NOTE***: Browning will take longer because of the vinegar in the marinade. Also if you used the full amount of wine, your meat will appear quite dark. NOTE****: This step gives you uniform size pieces. You can also refrigerate the meat at this step and prepare gravy later. NOTE:* I use a flour cloth towel as my base. I grate the potatoes on top of it and then bring all the corners together like a knapsack wrapping the potatoes inside. I continue to tighten the turns until I squeezed all the moisture from the potatoes.